Raspberry Pi+ HX1 Expansion Board with Radiometrix HX1 radio module(s) installed. Supplied with a stacking header and standoffs, SMA and module installed. This board is designed for stacking on a Pi In The Sky kit. Supplied with a 2x20 way 10mm stacking header and 2 standoffs for secure attachment to your Pi. Please see associated items for suitable antennas. 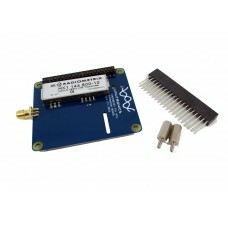 144.800Mhz suitable for Euro APRS. This is a -10 Module. 144.390Mhz suitable for US APRS. This is a -10 Module. 145.175Mhz suitable for Australian APRS. This is a -3 Module. This is not legal to fly this in the UK and generally you need an amateur radio license to use this (please check with your local legislation) .